Make the egg medium with egg yolk, alum and water, 1:1:1 by volume if you are painting without mastic. Egg yolk contains albumen [water], egg oil [nondrying] and lecithin [emulsifier]. Egg yolk itself is a painting medium, it bleaches white in sunlight. Mix egg yolk and water 1:1 to dry pigment, 1:1. Egg, unvarnished looks like gouache, it's a flat finish. Egg and egg emulsions dry hard, elastic and more resistant than oil color mediums by themselves. Oil of cloves, one drop per egg, will preserve a sealed wet egg, kept cool for one year. The icon, painted on wood was the next medium after fresco. In Byzantium, after a ninth-century council had confirmed the defeat of the Iconoclasts and made it safe to paint in the less durable egg, the style spread over Northern Europe and stayed in Russia for eight centuries. Egg without the addition of oil is called distempera, this was a preferred style from Giotto [1266-1337] to Botticelli [1444-1510], The addition of alum to the egg made it waterproof. Giotto also added cherry gum to make it more fluid, acting as a preservative as it was slightly alkaline. The support was wood or linen primed with gypsum or chalk. The ground had to be kept very clean because the thin medium shows through colors. A poor ground could be improved by a coat of egg and lime white before painting. Sandarac (sandracca) was a good hard, final varnish. Today, damar will do the job. When egg white is used, it's called glair medium and was used like ink on illuminated manuscripts in the 5th century, and as a size for gold leaf. 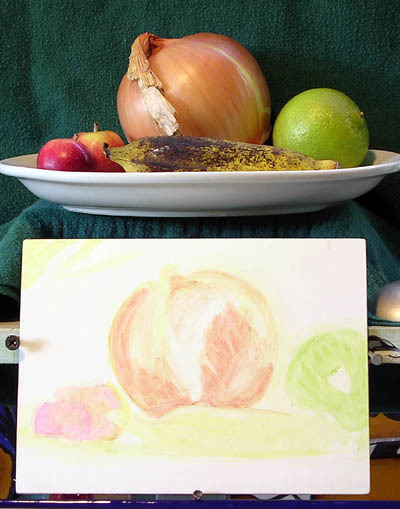 Egg white and alum make a good bodied paint medium, capable of making very opaque strokes. So it is written, I'm having trouble using these ultra fine new pigments making a solid dark with one stroke. Van Eyck [1390-1441] became very skilled at this technique, painting in water based egg tempera, then glazing with oil and balsam, going back to tempera for details and glazing again, Giovanni Bellini [1430-1516], in his life time went from egg tempera to oil. I'm going to start with egg yolk and alum. 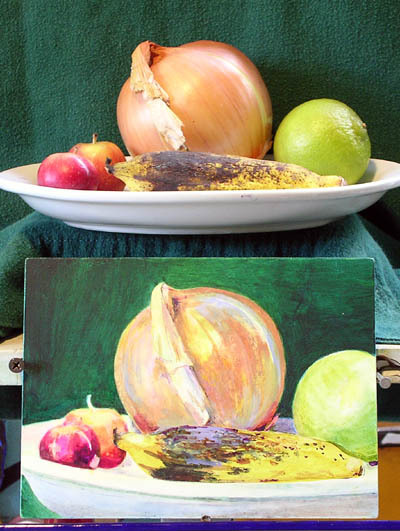 Painting with three transparent dry pigments. Black bananas, rare because they look so ugly. 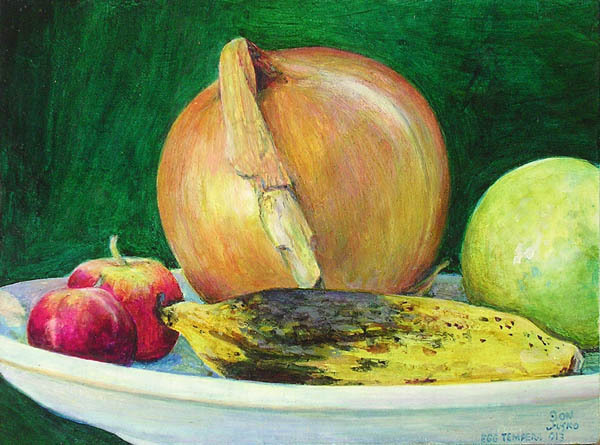 Most bananas are yellow, or red. These bananas are ready when the green turns to yellow which is after the brown spots are dark. The little apples taste just like the normal apples 5 times their volume. 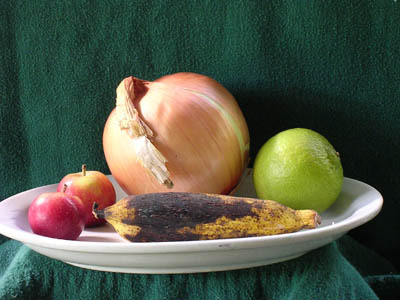 The very large onion is a Maui Onion, the sweetest in the world. The lime made a good opposition the magenta red apples. 11:40, I'm really enjoying painting with just a transparent triad palette. Fresco taught me how to paint without drawing first. I started with colors very light to lay the layout. 1:24, I just put in the dark background. this is a media that is very prone to thin washes. 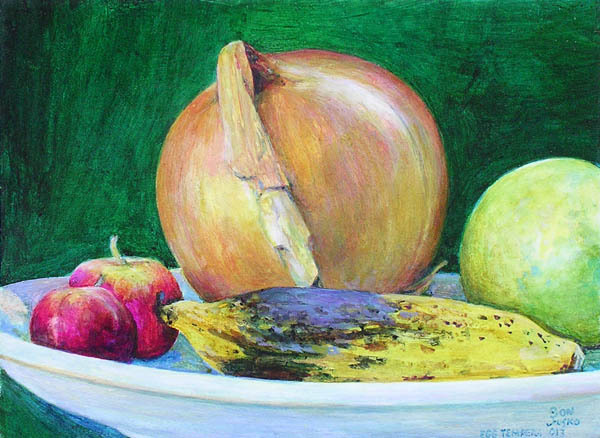 where oils can be one layer, egg tempera takes three. It's because the media as thin as water, almost, and even the softest brush paints thinly. Even thinner on this non-absorbent acrylic gesso. 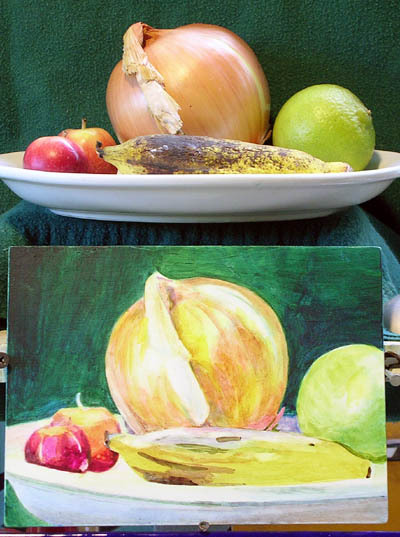 I'm afraid that oil paintings are going to chip off smooth acrylic panels eventually, even canvas paintings. Maybe not, we'll see. The only one I have heard about is Jackson Pollock in the late 40's, who's works are falling apart as we speak. Oil by itself just isn't sticky. Egg is moreso, and it isn't as brittle or shrink the way oil does. But it is tasty.. better to final coat it with sandarac or damar. The two part varnish Gamar won't yellow, just like polyurethane water based won't yellow. That's what I would use, but sandarac is hardest and that's what was used when this media got it's start. I'll go with mastic. I'll bet the best support for egg distempera would be good water color paper mounted on a stiff back. 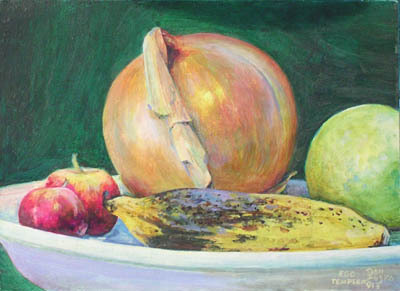 A ground is the prepared painting surface and for egg tempera this should be a traditional gesso. Gesso is a mixture of whiting (chalk, gypsum, marble dust or titanium oxide), rabbitskin glue and water. Heat the glue with a double boiler. 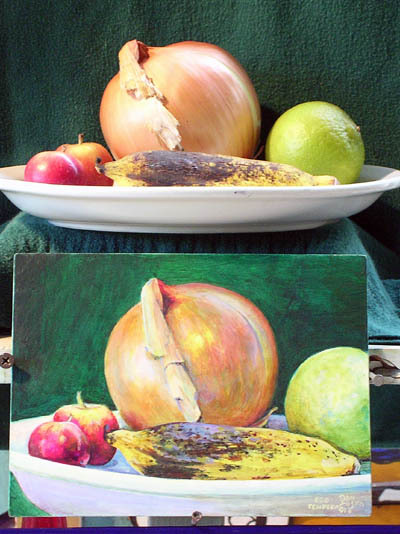 Acrylic gesso is not so absorbent and is certainly not chemically compatible with egg tempera or oil paint for that matter. The support must first be sized with a layer of rabbitskin glue which acts as an isolating coat and helps to bind the gesso to the support. This layer of glue sizing is made up of the same rabbitskin glue mixture that is used in making the gesso. Use the ratio of 1 ounce glue to 16 fluid ounces of water and 24 ounces of whiting for the gesso. Medium; 1:1:1 alum, egg and water. Dries as quickly as water dries. TIP: Sight with one eye and paint with two. Don't move your head. A white ground is important. An absorbent white ground like chalk would be better the my acrylic panel, Wet sand the panel, I did it with a kitchen scrubbie. Highlights can be scrubbed up while your painting leaving ground white. Painting with egg is tedious and hard work. No wonder Botticelli championed oil painting. Colors and edges have to be blended quickly as in fresco with just egg and alum. That's it for today, the light has changed too much even though the subject is in the shade. Layers build up slowly. More alum for a thicker medium. 2:04. Ammonia dissolves the egg, and won't harm the egg. It's a gas in water and it evaporates. I'm thinking I should have added some mastic, but still keep it on the water soluble side. That would have solved all the problems. Layers build up slowly. More alum for a thicker medium. Good morning, I added 25% 1:1 turp and mastic to the 1:1 egg and water. Painted the sides and background with the new media. On top of the egg it beaded and had to be worked in and on. On the sides it painted just fine and seemed to hold pigment denser. It added no gloss and dried quickly, On top of the background I will now switch back to just egg yolk and water. 11:40, My egg was going bad, I borrowed another from my neighbor, the Kaupo Store. So now my new mix is 1 whole egg, one half turp and damar and one half water, no alum. Here's where I am now. Today, clean up on the painting was easy. Egg could still be remove with a bristle brush delicately. Yes! This is the medium that had won in the Paint War over cera colla. Italy was coming on it's own as the art center. It paints fast and full, dries quickly and is fun to paint with. I guess I end up loving every medium, this one is up there with the rest of them but it requires more time. The darks seemed to be drying more matt surfaced so I layered the whole painting with medium. I'm almost finished. It dries faster then alkyd or Maroger's. It paints opaque and dries faster than acrylics or cera colla. It will 'pick-up' like wax until the egg has set. In humid weather the time is extended. 2:32, I'm really close to finished. The vials of color are amazing, like a Maroger glaze. And just like in acrylics, a layer of white will cover anything. Did I say it dries faster then acrylics, it does, but like lime fresco it takes longer to set after it's dry to the touch. 4:00 I'm finished. I just gave it another thin coat of medium to even out the matt. The next morning the power wouldn't come on and I liked what I saw with the overhead light off so I kept on painting on this picture. 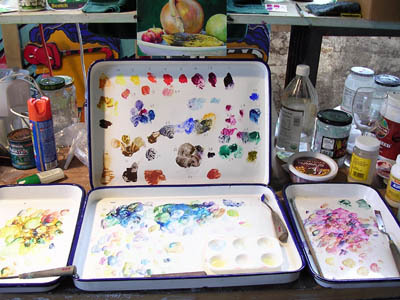 TIP: This layering order is best for transparent pigments; Yellow, Magenta, Cyan. 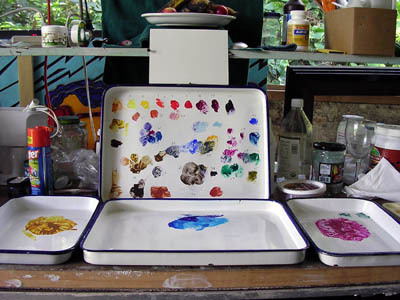 TIP: All of these colors are tenacious, they will stay in your brush until it's washed out with soap. Add a bar of soap and a soap wash basin, plus your normal water basin to your 'must have tools'. December 5th, 2004. The painting was finished without an overhead light that gave that nice yellow glowing reflection. Instead of making anything up I changed the painting to the new light. I caught up the browning on the banana, it will get all brown/black and still be firm inside. I used mastic to give it a finish. So I toned it down with some pigment in the mastic. TIP: Put the emulsion in a small jar and shake, don't bother stirring. Indian yellow PY153 from Zecchi, or PY50. Cyan PB15.3 from Senopia, It's the closest to cyan I can find, it still has a magenta cast to it, I would prefer the hue closer to manganese blue (Berium Manganate). This color can be made from Phthalocyanine PB15 made with chlorinated copper. 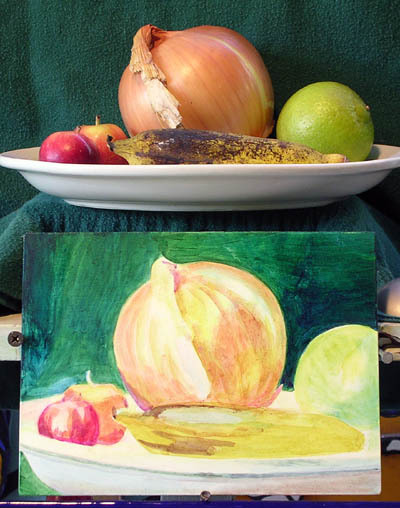 This was a great medium to work in and I wouldn't hasitate to paint with it again, if I have the time. It's a slow delicate layering of color. Your strokes must be quick to avoid dissolving the lower layer while you are modeling. The lower levels must be dry before you use them. Pure egg and water dry harder faster then egg, mastic and water. Wax/mastic and Maroger's black linseed oil and mastic still have much better techniques which means they are easier and quicker to paint with. Daniel Smith New Gamboge PY153 Nickel Dioxine is the best Indian Yellow O/s pigment. Grumbacher Thalo Crimson PV19 is more to the warm side.